Contact Bishop Wood’s Administrative Assistant, Nancy Sapakoff (NSapakoff@StAndrews.Church or 843.284.4324), for date availability and to schedule an appointment with our staff to request permission for a marriage ceremony at St. Andrew’s. The earlier you begin the process, the better; in any case, 30 days notice is necessary. Complete the marriage applications and the pre-marriage FOCCUS inventory before the first appointment. If applicable, complete necessary paperwork (in divorce situations) to be submitted to the Bishop for approval. Set wedding and rehearsal dates/times after the 1st meeting pre-marital counseling appointment. Nancy Sapakoff will schedule the wedding and rehearsal on the church calendar. Complete individual preparation sessions with Premarital Mentors, usually 7 or 8 hour-long sessions. Contact the music coordinator for booking and to discuss music selection 4 to 6 months before your wedding. Contact the St Andrew’s Flower Guild (Penny Bagwell (pennybagwell@gmail.com) or Mac Langley (mac.langley@gmail.com) ) to discuss decorations. Notify all attendants of date and time for the wedding and the rehearsal. Submit the marriage license, scripture reading selections, wedding bulletin and required fees to the Nancy Sapakoff at least 1 week before your rehearsal. Attend the rehearsal with the Clergy, musicians and all members of the wedding party. Relax so that this special time may be enjoyed and remembered. Back to Weddings at St. Andrew’s. Because the wedding is a service of Christian worship, distractions during the service are discouraged. Photographers should be unseen, unheard, and unnoticed and should dress appropriately, keeping in mind that the wedding is a worshipful celebration. Photographers and Videographers who wish to look at the church and facilities prior to the day of the wedding should contact Nancy Sapakoff (NSapakoff@StAndrews.Church or 843.284.4323). Most requests to see the building during working hours can be accommodated. Photographs may be taken before or after the ceremony in any part of the building. The empty, decorated church may be photographed before any guests are seated. Photos taken before the ceremony must conclude 30 minutes before the marriage ceremony begins. No flash photography or video lighting equipment may be used during the ceremony. Timed exposures (no flash) may be taken from the rear of the Sanctuary if it can be done quietly during the service. Flash photos may be taken of the bridesmaids, ring bearer, flower girl, bride and her father as they start down the aisle. These photos should be taken within the back half of the nave. Flash photographs will be permitted as the couple comes down the aisle during the recessional. The wedding party may return for photos after wedding guests have departed, if they wish. Photographs of the bridal party may be taken outside of the church before the ceremony as long as it does not interfere with or delay the start of the service. The bridal party may be photographed at the rear of the church before the procession begins and as they reach the rear of the church after the ceremony. No flash pictures are allowed to be taken during the service by the photographer or guests. The photographer may shoot from a fixed, unobtrusive position. The photographer and videographer may not move about the church at any time during the ceremony. A video camera with no artificial lighting may be used in the balcony only. The wedding party may return to the church following the ceremony for additional pictures. Pictures should be completed in 30 minutes so the church can be prepared for other services. On the day of the wedding, one of our sextons will make himself known to you. He is very knowledgeable of everything that will happen before, during, and after the ceremony. Consider him as a resource. You may also receive instructions from him about what may or not be appropriate or permitted. Be assured that the sexton speaks with the authority of the Rector of St. Andrew’s. Keep in mind that his aims are the same as yours – For this wedding to be perfect and for you to capture the best moments while maintaining the decorum expected in a worship service. Download these instructions as a PDF for printing or emailing. The amount of floral decoration in the church sanctuary will naturally vary with each wedding. The florist should Contact the St Andrew’s Flower Guild (Penny Bagwell (pennybagwell@gmail.com) or Mac Langley (mac.langley@gmail.com) ) to discuss decorations, to arrange the time of delivery, and decorating of the church. Standard protocol for a wedding at St. Andrew’s is that the couple leaves the wedding flowers placed in the altar area as an offering to God. The flowers will be used at the regular weekend services. Should the wedding take place on Sunday afternoon, the flowers should be in place before the first service on Sunday morning. All decorating must be completed one hour before the service is scheduled. All fresh greenery should be prepared prior to arriving at the church. No nails, tacks, screws, staples, pins, or tape are to be used in any part of the building or on any furniture. Only ribbon or specially designed pew clips may be used to secure bows and flowers to pew ends. The candles on the altar are the only open flames that may be used. Brass stands for covered candles on the end of the pews are avail- able through St. Andrew’s. If desired please notify Penny Bagwell or Mac Langley. Electric candles may be used in the window sills of the old church sanctuary. Flowers need to be placed where there will be no water damage or other stains. No flowers shall be placed on the musical instruments. No furniture shall be moved or rearranged without specific per mission. Removal of all decorations, other than the flowers in the altar area, must begin immediately after the service. A crew sufficient to adequately remove decorations must be provided by the florist. Any florist may be used, however, the Flower Guild must approve all arrangements, vases, window treatments, and other decorations. When more than one wedding takes place on a given day, it may be possible to coordinate the floral decoration of the church with the other couple. The Flower Guild will assist in this process. In the Historic Church there are two stands on either side of the altar for flowers. Many florists may have liners for these vases. If not, or if they are not familiar with St. Andrew’s, the bride and florist should visit the church and meet with the Flower Guild. Flowers should not be higher than the cross on the altar. 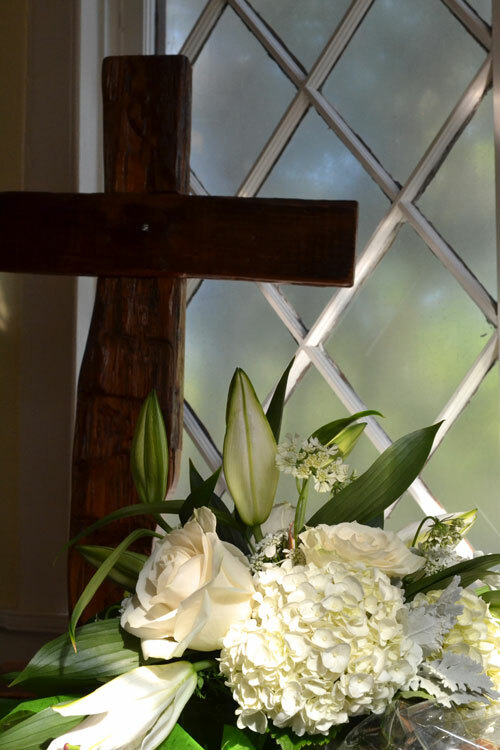 Arrangements behind the cross are not permitted, nor are artificial flowers. Florists must remove any equipment or decorations, other than the altar arrangements, as soon after the service as possible. St. Andrew’s provides white silk damask hangings on the altar, reading desk, pulpit, etc. for weddings. No other hangings may be used in the Historic Church or Ministry Center. The Altar Guild will place the three branch candelabras on the altar. Nothing may be attached to these. There are also eight (8) brass stands for candles at the end of some of the pews. Please contact Nancy Sapakoff if you are interested in using these pew candles. No other candles should be used behind the altar rail, on the pews or in the windows. The fire marshal prohibits the use of any additional candles. If a Unity Candle is desired, it may be a part of the reception but not the marriage ceremony. The Sexton will open the church two hours prior to the service. Please note: The church is not staffed or open on Saturdays unless prior arrangements have been made with the Rector’s Personal Assistant. St. Andrew’s has limited space for dressing. If the bride and attendants plan to dress at St. Andrew’s, the Sexton will open the library, located next to Sams Hall (Parish Hall), two hours prior to the wedding. The bridegroom and his party should dress elsewhere and arrive one hour before the ceremony; however, the Sexton will make every effort to reserve a space for dressing if needed. Please be advised, the church cannot be responsible for any articles left at the church or in the dressing areas. Immediately before the ceremony begins, the groom’s mother, followed by the bride’s mother, will be escorted to their pews by an usher. At this time, no more guests will be seated until the bridal party has entered. As for any worship service of the church, it is expected that the marriage ceremony will begin on time. The cooperation of all wedding party and family members, photographer, etc. is requested to ensure this happens. During the service, the Clergy will prompt the congregation about when to sit or stand. Guest registers and receiving lines are more appropriate as a function of the reception. While inclusion of young children in the wedding ceremony may be desired, for family or personal reasons, we suggest that children under the age of 5 not be included in the wedding party. Developmentally, young children do not possess the maturity necessary to “behave” through, what to them, is a long and boring ceremony. Experience has shown us repeatedly, that when placed under substantial expectations implicit in such an environment they generally become disruptive to the ceremony, diverting attention from the bridal couple to themselves. Ideally, children in the wedding party will be 7 years or older. As with every other aspect of the ceremony this guideline may be discussed with the Clergy during pre-marital preparation. Requests to have a rehearsal dinner or wedding reception at St. Andrew’s must be made with the Nancy Sapakoff when arranging the wedding date and will be considered based on church facilities availability. Dinners or receptions may not last longer than three hours and the caterer is responsible for clean-up. Alcohol is not permitted. No alcoholic beverages may be consumed and no smoking is allowed on the premises at any time. No one under the influence of alcohol or drugs will be allowed to participate in the rehearsal or the wedding. Usage of either on church grounds may result in the immediate cancellation of the wedding.